You know, I keep thinking I’ll do a few projects and write up the posts about them for the blog. 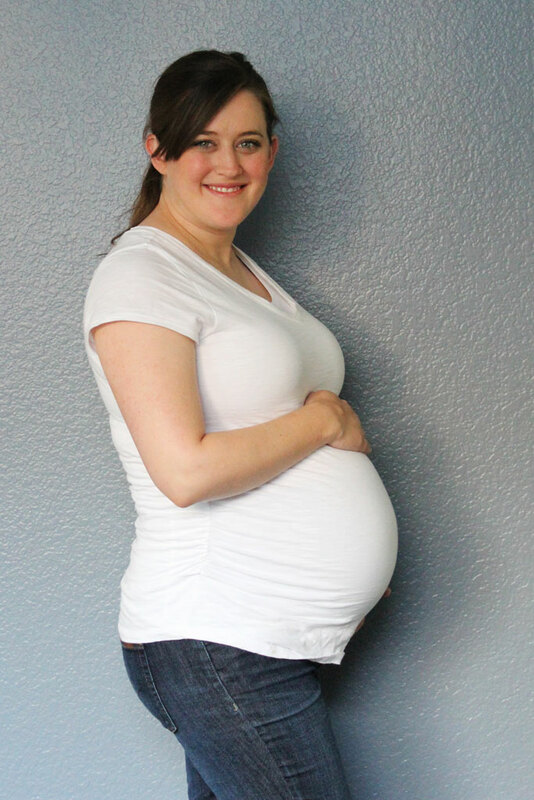 But I’m not going to lie… this whole 3rd trimester pregnancy thing… everything is harder! And getting up the motivation to do a project? Pretty much non-existent right now. And since I am using the time to hang out with friends, sit and relax with my husband and just generally do nothing, I’m going to savor this time before baby and not feel bad about it! So for now, please forgive my blogging hiatus and just enjoy the pregnancy updates! Baby’s Size: She is about 5 lbs…which the books say is about the size of a head of romaine lettuce. We are down to weekly doctors appointments, and the doctor thinks she won’t be a big baby, but is tracking along just like she should be… so I’m going to trust that and not worry too much about a big or small baby! Baby’s Progress: Apparently this week she loses her downy hair covering her body and the stuff on her skin that protects her from marinating in the womb for 9 months. At this point she is getting ready for her grand entrance, so she is getting better at her own temperature regulation, etc. Sleep: I wake up so many times in the middle of the night to go to the bathroom!! Its outrageous! I think I could sleep pretty well if it weren’t for that! I have transitioned full time to using the giant pregnancy pillow since that helps me essentially have two pillows under my head, making it easier to breathe! But it means when I get up to go to the bathroom getting back into our tall bed, over the giant pregnancy pillow (all while being totally huge and off balance) means its a bit of a challenge and I’m pretty sure I wake up Reese every time I do it! Milestones: The bags are all packed, car seat is in the car, and the husband has all his instructions on what all to do when. So I feel like we are ready… which probably means she won’t come until after her due date… but in case she does come a little early… we are ready! Favorite clothing item of the week: Mom and I went shopping last week and bought a non-maternity dress that looked super cute for both a shower and a wedding I attended this week! Dressing up when you are 8+ months pregnant is not easy to do, but I loved how comfortable this dress was and it was flattering too! Also, I snagged a pair of Cole Haan black wedge pumps that have Nike Air in them… seriously the most comfortable dress shoes I have ever owned. They aren’t the most stunning shoes I have ever seen, but they are really cute and SO comfortable that I could wear them for days and my feet never hurt… which is pretty impressive coming from a pregnant woman! Symptoms: Nothing much has changed since last week… everything is harder than it was several months ago, but since I get to feel her rolling around and kicking, I’m not going to complain too much. And really after reading some of the symptoms I could have… I’m going to consider myself blessed! Workout: I keep hoping it will warm up just a bit more and I can swim laps in our pool… and we are so close to the pool being warm enough… so maybe by next week I can add that as my workout. But for now… my workout has been just normal every day life… which at this point pretty much feels like a workout!! Happy birthday, gorgeous pregnant lady!